For the shell, I plan on using an old well bladder tank, the kind that are used to maintain pressure in a well-fed water system. Inside that of that will be 1 or 2 inches of Kaowool insulation (depending upon the diameter of the tank I find) and then at least 2-1/2 inches of castable refractory cement. My plan is for an 8 inch diameter center cavity for the crucible to sit in. In the bottom there will be a smaller-diameter recessed area. This area will be equipped with horizontal channels leading to a central drain hole. 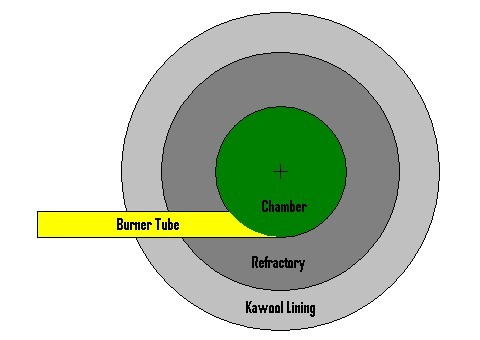 This will channel any molten metal down into the drain in the event of crucible failure.